Don Smith (California, United States) on 9 January 2011 in Landscape & Rural. Photographic software never ceases to amaze me. Just when I think I have one piece of software figured out, something new is introduced and all my old ways of thinking and working are twisted into a new reality! Take HDR software for example. I have used Photomatix Pro for most of the past four years and thought I reached a threshold of what the software could accomplish. Further, I drew the line at trying to HDR any series of images with motion as I was never satisfied with the final rendition of the software. Then comes Nik HDR Efex Pro and once again the game changes - for the better I might add! 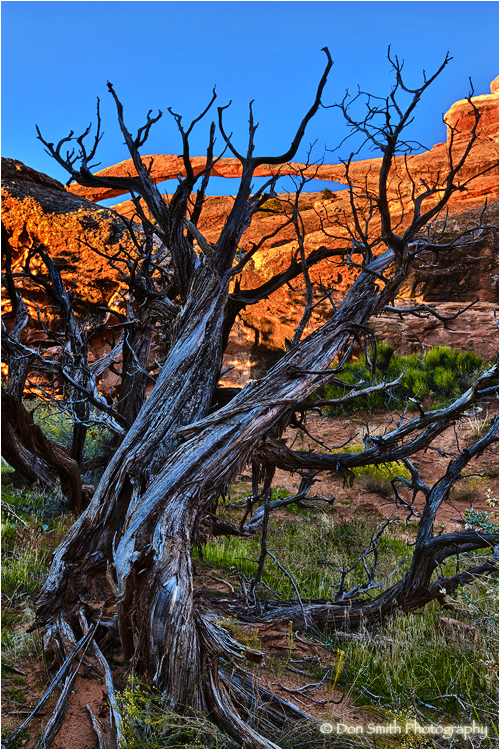 Today's image was was captured on during this past fall's Arches/Canyonlands Workshop in eastern Utah. Less than a mile's hike from Arches National Park's Devil's Garden parking lot affords one this view of the world's largest spanning arch - 290.1 feet (which beats Zion's Kolob Arch by three feet). I like taking my students to this location for a sunrise shoot as the sun rises approximately 45-degrees off-axis and skims the arch with beautiful warm light. The show comes and goes quickly, especially on clear-sky days, so I arrive at least 30-minutes prior to sunrise. Having photographed this famed arch for many years, I made sure my students were content, then I challenged myself to find something different than what I had done in past years. Continuing on the trail past Landscape Arch, there is a small but impressive grove of dead Juniper snags. I had vaguely remembered these snags from the previous year and decided to see if I could somehow make them work as a foreground. I was also testing Nik Software's HDR Efex Pro and felt this scene would be a great test. I simply metered both the shadows and the highlight areas of the scene and bracketed my shutter by one-stop. Using my 16-35 mmL Series II lens allowed me to very close to the foreground snag. Part of what I love about the software is that it offers presets as a starting point. I like my HDR work to not look like it was HDR'd, so I generally opt for the Realistic preset as a starting point. For this image (a combination of 6 frames) the software absolutely nailed it! I really had very little to do to finish it off. My main concern was that I retained the beautiful texture in the snag and as you can see, it is all there. Moreover, the small grass that were bobbing and weaving in the morning breeze recorded sharp (I have no ideas how the software pulled that one off)! Foreground elements are so important in the vast majority of my work that I try to find them for virtually every scene, even when photographing an icon such as Landscape Arch. If you want to set your icon images apart from the masses, challenge yourself to find a foreground element. With as good as HDR software is today, even in extreme contrasts such as this scene you can rest assured the software will retain all the glorious detail that your eyes can see. Can't wait to see what new pieces of software are in the pipeline for 2011! BTW - if you are interested in either Photomatix, Nik, or Topaz products, please use my codes listed below to receive a discount! I like the processing work on this Don and the composition is great! @Scott F. Schilling: The more I work with Nik's HDR Efex Pro, the more impressed I become. @Richard: I believe the key is to always think about a foreground. It doesn't have to be a knock your socks off element, just something to compliment the main subject and create depth. Before HDR, there would have been no way to pull off this scene as the camera simply cannot see what our eyes see. I'm trying to use HDR to eliminate the camera's inadequacies - that's all. Magnifique lumière derrière ce tronc d'arbre mort !! @Jean-Louis: Thanks as always Jean-Louis - Merci beaucoup. This is really amazing - your new software has done wonders!! @Elora: Thanks Elora, its amazing how good software has become. I can remember the early days of trying to decipher Photoshop! Fantastic composition! really wonderful capture! @Demo: Thank you Demo and welcome to my blog. @James Guillory Photography: I won't have a day off now until February 2nd! Looking forward to it all though, how can I not be happy with a camera in my hands every day. I start tomorrow with a private at Big Sur, then the workshop begins Tuesday. After that it is off to San Antonio, then on to Death Valley. I return home for another private and some Sharks events. I'm ready - I think!!! This petrified tree and these colors fantastic are a array sublime. A great photo. 5 * Good day. @Tede: As I noted in my narrative Tede, it was imperative to retain the beautiful grain and texture of the juniper snags and the software combined all the tones beautifully. Give the software a try, I think you will be duly impressed! Don I have to agree with the others, here. The tools you had at your disposal were not only put to the test but, at your j=hand, the display, the outcome, was probably beyond anyone's imagination even at the developer's point. This is ethereal and beautiful all at once. The branches of the Juniper snag appear to actually be fingered (wrapped) around the arch and holding it up..like some creature from the past- or the future. You often describe Bristlecone Pine Forest as "otherworldly." Well, this is beyond compare and extremely - and amazingly - out of this world as well.. Best of luck on your upcoming schedule...Eagles are done but Seahwks "live" for another day...Cheers Don!! @Denny Jump Photo: Hi Denny, I'm just about to embark on my 16-day odyssey but I'm looking forward to it! I start today with a private lesson in Big Sur then the workshop starts tomorrow. Sorry about your Eagles, I've got my own concerns about my Sharks (four-game losing streak - ouch!!!). Your work is always flawless! Beautiful! @Magda: That is a very nice compliment and a great way to start my day - thank yo so much Magda! excellent composition - i like how you positioned the tree against the orange rocks - they are nicely separated and contrast with each other! @DarkElf: I'll take credit for the idea, but have to give full credit to the amazing HDR Efex Software for completing my vision. Hope all is well down under. what for an amazing photo! the light of the mountain in the back is so beautiful! alltogethe a really impressive landscape my dear! @klauSZ: Thanks so much, hope you are having a fantastic day. @john4jack: Same here Jack, it's pretty awesome software! I love that foreground tree texture! Really lovely NEW way to see this awesome arch too! The contrast between colors in perspective must be one of your best talent. Great shot!